When there isn't enough space to display all the items in the main menu, this is automatically replaced by the Hamburger button. This also happens if you did not choose to create a responsive website (in Resolutions and Responsive Design). If the Menu object is inserted in the template editor, the available space depends on the size of the object itself. If, on the other hand, the Menu object is inserted in a page, the amount of space is determined by the size of the cell in the page layout table. Regardless of the space available for the Menu, you can choose to always use the Hamburger Button by activating the Always display the Hamburger Button option in the Main section. The Hamburger Button is square, and its height and style are defined using the options in the Main section. Click on this button to open the pop-up hamburger menu, which shows the first-level items of the main menu. 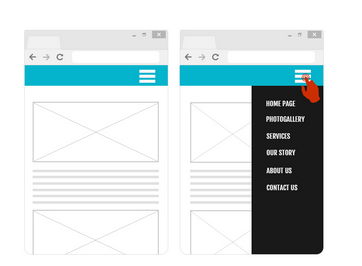 ▪ Opening: this specifies whether the menu opens on the right or the left when the hamburger button is clicked. ▪ Effect: this specifies the effect with which the menu is displayed. ▪ Time: defines the speed with which the Menu appears upon clicking the Hamburger Button. ▪ Background color: this specifies the color of the hamburger menu's background. This color is semi-transparent (taking the value of the Opacity option) and it creates a filter to dim the page underneath. ▪ Opacity: this specifies the level of transparency of the hamburger menu's background color. Values closer to 0 increase transparency, letting the page's contents show through. ▪ Spacing: this sets the value (in pixels) of the space between each button (outer margin). The button width must take into account the overall space available for the menu: this parameter can be changed if you are not using a default graphic template (see Template Structure). You can define the appearance of the single elements in the hamburger menu. First, select the Menu item to work on: Background, Menu Item, Item on mouseover, Separator and Separation line. ▪ Background color / Text color: these define the color for the background, the text of the items in their various states, the menu separator and the Separation line. ▪ Border: this defines the color, thickness and shadow of the background borders (as a whole or singularly). ▪ Button text: this applies a text style (Normal, Bold, Italics or Underlined) to the Item on mouseover or Separator. This style is in addition to the settings in the Button text section. ▪ Width: this is only available for the Separation line and it sets the width of the line as a percentage of the width of the hamburger menu.